Come see us at the Suburban Home Show! Only 1 more day until the Suburban Maryland Fall Home Show! We have a coupon worth $450 off if you schedule an in-home consultation with us at the show or call us at 1-800-287-4016 to schedule over the phone to receive your coupon. Come see what our talented designers can do for your kitchen! 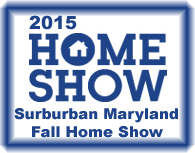 The Suburban Maryland Fall Home Show will be at the Howard County Fairgrounds, October 2-4. Hours: Friday, October 2 – 11-9 p.m., Sat. Oct. 3 – 10-8 p.m., and Oct. 4 – 10-6 p.m.